French roulette revolves all around luck - and a wheel, table, and ball, of course. There are different roulette versions out there, but French roulette happens to be pretty similar to European roulette. The wheel in French roulette comes with 36 numbered pockets and your goal would be to guess the slot or pocket in which the ball is going to drop on after the wheel stops. Two kinds of wheels exist: the European wheel and the American one. There is one difference between them: the amount of zeroes that exist on them. 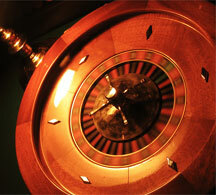 In American roulette, the wheel has two zeros, significantly increasing the house advantage. French roulette, however, puts the European wheel to use, where there is only one zero; this gives the player much better odds. Also, the numbers are arranged a little different on these wheels. The objective of these French roulette game would be to guess the number that the ball falls on while the wheel spins. After each player makes his bets, the dealer will release the ball onto the wheel in one direction as it spins in the other direction. The ball will eventually stop in a numbered pocket on the wheel. If a player properly guesses where this ball falls into, he wins. Three kinds of bets exist when it comes to French roulette: call bets, inside bets and outside bets. Inside bets refer to bets that players make on various number combinations from 0 to 36 as they correspond to the pocket numbers on the wheel. These bets exist on the inner table layout. Outside bets, on the other hand, are made on the outer table layout. They are placed on black or red colors or on different number combinations. When it comes to French roulette, call bets are called "announced" bets. Different kinds of announced bets also exist. The two main announced bets would be the zero neighbors, which include 17 of the numbers that show up like an arc within the table layout, and the third of a cylinder, which deals with 12 numbers of the arc, from 27 to 33. The other 8 numbers of the wheel that can be found in smaller arcs are known as orphans. Any bets made on those numbers would be called plein orphans, which cover orphans with a chip on every number; and cheval orphans, which cover orphans with a chip sitting on 1, another sitting on 17, and other chips on various other numbers.